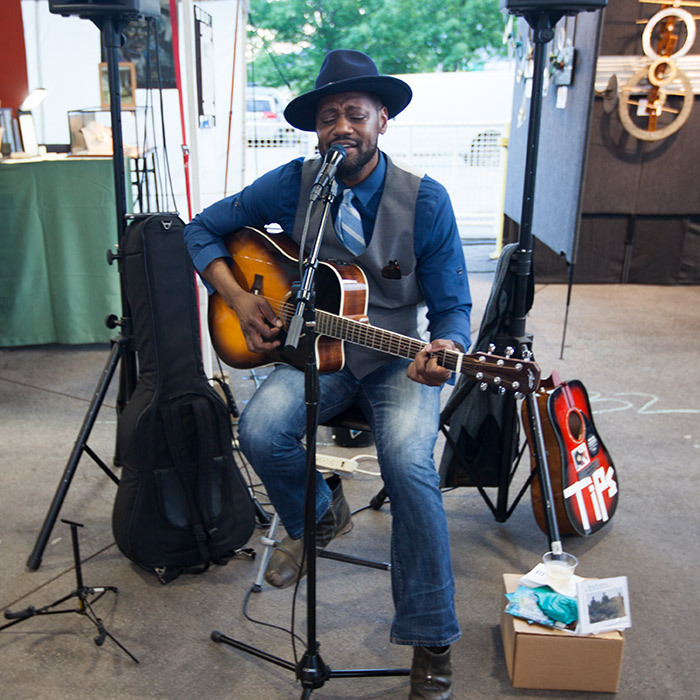 An essential part of Chattanooga’s creative capital, 4 Bridges Arts Festival (4BAF) cultivates and inspires an appreciation for the visual arts by creating opportunities for exchange between working artists and the public. Dates for the 2019 4BAF are Friday, April 12-Sunday, April 14, and the festival venue is First Tennessee Pavilion, located at 1826 Reggie White Boulevard in Chattanooga, TN. The festival will begin with the Preview Party, a ticketed, gala-style event. The festival officially opens to the public on Saturday, April 13 and continues through Sunday, April 14. Highly-anticipated and culturally-prominent, 4BAF is a juried art show that receives applications from visual artists from across the country. The festival will showcase the distinctive talents of 150 artists and offer $10,800 in cash awards to artists selected by the 2019 jury panel. Established in 2000 by Association for Visual Arts (AVA), 4 Bridges Arts Festival is an initiative dedicated to promoting the visual arts through programming that cultivates an appreciation for the creative process and advances opportunities for working artists. First Tennessee Pavilion, 1826 Reggie White Blvd. Admission to the festival is $5, Children 12 & under are free. Tickets sold at the door. Every year 4 Bridges Arts Festival debuts its marketplace during the annual Preview Party. A ticketed social event, the Preview Party is a celebration that opens festival weekend and features select wines, signature cocktails, and a buffet of gourmet hors d’oeuvres. Individuals can purchase tickets to the Preview Party beginning February 20, 2019. The sponsor for the 2019 Preview Party is Barnett & Company, a Chattanooga-based investment and wealth management firm. Dedicated to community, Barnett & Company has been a stalwart supporter of the arts for more than 35 years. Prioritizing a standard of customer service that ensures customer satisfaction, Barnett & Company understands the complexities of the ever-changing world and addresses the distinct goals of each client through professional consultations, personalized investment management, and comprehensive financial planning. Invest in Chattanooga’s Creative Capital. Become a Sponsor. By sponsoring of the 4 Bridges Arts Festival, you are investing in a community asset; that is economically valued and culturally significant. Your support of the 4BAF will be a concrete investment in Chattanooga’s creative capital. The Emerging Artist Program is designed to nurture and advance the careers of local talent. Every year, Association for Visual Arts (AVA) spotlights new artistic talent during 4 Bridges Arts Festival. By providing exhibition space to individuals who have limited experience showing their work at art festival or in galleries, AVA supports the burgeoning careers of emerging artists by showcasing their fresh voices to enthusiastic art collectors. Through 4 Bridges Arts Festival, AVA exposes emerging artists to a real-life professional experience while introducing the community to dynamic, new creative perspectives. AVA will select up to six applicants to exhibit as emerging artists. AVA also waives the festival booth fee and provides portable walls and drapery from which emerging artists can design their booth presentation. First Tennessee Bank, a champion of innovative ideas and the entrepreneurial spirit, is supporting emerging artists as a 2019 Walnut Street Bridge sponsor of 4 Bridges Arts Festival. Born and raised in Iowa City, Iowa, Vandewalle recalls a childhood divided between two passions: an insatiable love for books and a profound affection for the natural world. She was either outside exploring nearby fields and forests or inside scouring through shelves at the public library. These early experiences awakened her creative spirit and became the foundation that has defined her distinctive artistic voice. Volunteers are essential to the overall success of the festival. Please consider participating as a volunteer at the 2019 4 Bridges Arts Festival. Please list any physical limitations that could impact your volunteer experience. Please let us know any details about when you prefer to volunteer. SATURDAY, APRIL 13, 2019-Select one or more shifts when you are available to volunteer. I am available from 10 am until 2 pm. I am available from 2 pm until 6 pm. I am flexible between the hours of 10 am and 6 pm. I am willing to volunteer the entire day, 10 am until 6 pm. SUNDAY, APRIL 14, 2019- Select one or more shifts when you are available to volunteer. I am available from 11 am until 2 pm. I am available from 2 until 5 pm. I am available from 5 until 8 pm to assist with festival breakdown. I am flexible between the hours of 11 am and 8 pm. I am willing to volunteer the entire day from 11 am until 8 pm. As a volunteer for 4 Bridges Arts Festival, I release and forever discharge and hold harmless the Association for Visual Arts ("Nonprofit"),a nonprofit organized and existing under the laws of the State of Tennessee, and each of its directors, officers, employees and agents from any and all liability, claims, and demands of whatever kind of nature (bodily injury, personal injury, illness, death or property damage) either in law or in equity which arise or may hereafter arise from the services I provide to Nonprofit while volunteering. Thank you! The volunteer coordinator will be in touch with more information. Locally recognized as a champion of the visual arts, Angela Supan is a Chattanooga native who is regionally respected for her efforts to nurture the arts throughout Southeast Tennessee. Her experience and expertise have been vital to defining a regional narrative that not only established but also continues to showcase Chattanooga as a distinctive and credible cultural center. For more than 20 years, she has been professionally associated with River Gallery, located in the Bluff View Art District, where she is currently working as the assistant director. In this role, Angela brings an acumen that is relevant, practiced, and fortified with enthusiasm and scholarship. Her relentless focus on the economic viability of both the gallery and the artists represented keeps her current on the trends and news impacting the art world. She is also responsible for identifying emerging talent, coordinating gallery installations and off-site exhibits, cultivating relationships with art collectors, organizing special events, overseeing media relations, and networking in the community to boost and heighten awareness. Angela’s community service reflects her passion for the visual arts. She has served on various committees for the Hunter Museum of American Art, including participating on art selection committees for events such as Spectrum and Avant Art and as a member of the search committee tasked with hiring a new executive director. She has also provided leadership and guidance as the co-chair of Visions, an art auction gala that supports Girls Preparatory School, and as the recording secretary for the Junior League of Chattanooga. A graduate of the University of Georgia, Angela holds a bachelor’s degree in art history and Latin. Following college, she worked for three years as a collections intern for the curator of prints and drawings at the Georgia Museum of Art. While not always immersed in the business of art, Angela is always an avid collector and enjoys finding new and fresh pieces to add to her personal collection. Her other interests yoga, live music, and travel. She also enjoys spending time with her husband, Ricky, with whom she shares a love for animals, especially for two rescues, Rosie and Laney. As director of brand strategy, boutique and lifestyle hotels for Vision Hospitality Group, Ashley is responsible for guiding sales and marketing, brand development, positioning, design, procurement, and vendor negotiations. Ashley earned a degree in hospitality/resort management and marketing from the University of Memphis. She began her professional journey as a sales executive for Entercom Communications and transitioned into account management for D. Canale Beverage Company. Her rapport with customers and exceptional leadership were the foundation for an offer from Beale and Second Inc., where she managed the planning of corporate events within the historic Beale Street section of Memphis. In August 2011, Ashley established an event management firm specializing in planning large-scale events for Fortune 100 companies. In early 2013, Ashley joined Marriott International as an area sales executive, and in 2015, she accepted a position with Vision Hospitality as the director of sales and marketing for The Edwin, the company’s first boutique hotel. Recognizing Ashley’s talents, Vision Hospitality expanded her oversight to include coordinating the hotel’s interior design, curating the hotel’s collection of local art, and creating a comprehensive strategy specific to The Edwin brand. Because of the overwhelming success of The Edwin, Vision Hospitality promoted Ashley to director of brand strategy, boutique and lifestyle hotels. Ashley is a graduate of Leadership Chattanooga, serves on the executive board of the Women’s Fund of Greater Chattanooga, the marketing committee for A Step Ahead Chattanooga and is a member of Chattanooga Women’s Leadership Institute. An enthusiastic collector of art and antiques, she enjoys spending time with her husband, Strat, and their dog, Winston. Karen “Candy” Kruesi has been investing in Chattanooga’s creative capital since 1982. A native of Houston, Texas, Candy left the Lone Star to study at Sarah Lawrence College and continued to the University of Colorado where she earned a master’s degree in Slavic Literature and Languages. Upon completing her educational pursuits, Candy moved to Washington, DC and embarked on a career defined by interesting, diverse experiences. Her professional life includes working for an intelligence organization funded by the CIA, the DIA, and NSA, serving as Special Assistant to the Assistant Secretary of the Department of Housing and Urban Development (HUD,) as well as launching and managing a limited edition art publishing company established specifically to meet the needs of artists and printmakers. A knowledgeable and masterful fundraiser, Candy has been a prominent and effective leader among a wide range of nonprofit organizations. Her past involvement includes serving as a board member for the Community Foundation of Greater Chattanooga, Friends of the Festival/Riverbend, the woman’s found, the Chattanooga Chamber of Commerce, Girls, Inc., the Chattanooga Theatre Center, Public Education Foundation, Southeast Center for Education in the Arts, and the Animal Care Trust. She has also been chair of the board of directors for the Chattanooga Symphony and Opera, the College Access Center, Mark Making, the arts grants program Makework, and the AIM Center. Currently, Candy serves as chair of the board of trustees for the Hunter Museum of American Art, as director emeritus for the AIM Center, chair of the advisory board for String Theory, and serves on the William L. Montague Performing Arts Fund at the Community Foundation. Regionally, Candy served as Trustee of the Goldfarb Foundation, a member of the Region III Health Planning Council, and the Chair of the Development Task Force, National Arts Education Consortium at the Getty Institute of the Arts. Her awards and recognition include Allied Arts (now ArtsBuild) Bravo Award for fundraising in the arts, National Communicator Award, AIM Center Life Achievement Award in Mental Health, and was a Jefferson Award nominee. Candy was a founding director of Capital Mark Bank and Trust.A seasoned art collector and music devotee, Candy also considers herself a zealous animal lover, adventurous traveler, and fervent soccer fan. Festival dates are Friday, April 12-Sunday, April 14, 2019. 4 Bridges Arts Festival begins on Friday, April 12, 2019 with the Preview Party. A ticketed event sponsored by Barnett and Company, the Preview Party opens the festival weekend and offers eager art collectors an early look at the art presented in the marketplace. The festival opens to the general public at 10 am on Saturday, April 13 and continues until 5 pm on Sunday, April 14, 2019. Admission to the festival is $5 per person, Children 12 and under are free. Where is the festival site? Food vendors will be available to provide a menu of delicious food. Bitler Bistro, Choo Choo Kettle Corn, Clumpies Ice Cream, Fun Time Foods, Kenny’s Smokehouse. Lupi’s Pizza, Miller Lemonade and La Familia.